Perfume Pagoda is a collection of many pagodas, temples, caves with the main emphasis which is Thien Tru Pagoda, Huong Tich Cave, Son Thuy Huu Tinh Cave, Thanh Son Pagoda, Long Van Pagoda, Ngoc Long Cave… In the Huong Tich cave has the Buddha statue made of green stone carved under the reign of Tay Son and tens of thousands of stalactites with many strange shapes which appeal the tourists to visit these places. Many people come here to pray for peace, children, career and so on but others just want to enjoy the scenery of Huong Son. 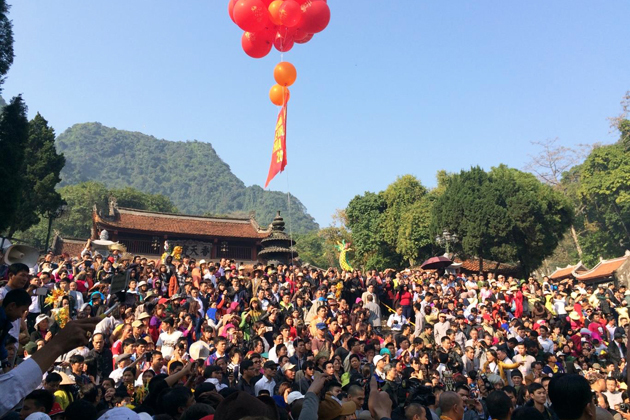 In 2017, the spectacle of money scattered, littering, jostle in Huong pagoda at this year appear less. Meanwhile, the nice weather along with the charming scenery make visitors get a new look for this place. Expected in 2017, the number of visitors and pilgrims during the festival during 3 months is from 1.3 million to 1.5 million. From a far distance, Tro wharf has dense stacking boats forming an impressive bow. This year, at the bus station, wharfs, and stopping points … the organizers serve for visitors free of charge toilet. This is a remarkable new view at the festival. With the theme ” Disciplined festival”, the festival this year has reduced the people who scatter money, litter, … Traffic road and inland waterway is safer when the security units always tighten and check frequently..